Do you kno how meny speling mistaks are in this sentance? Do you doubt “embiggen” is a perfectly cromulent word? Then Wurd might be for you. Wurd is an addictive game that tests your vocabulary in a deceptively simple way by simply asking you if a word is real or fake. I had a sneaking suspicion I was going to like this game when I saw they’d taken loading screen inspiration from Sim City (“Reticulating phonemes”, indeed! ), and I was right. Despite a rather sterile interface, Wurd is a titillatingly delightful way to give your vocabulary a workout. You have your choice between Marathon, Time Trial, or Practice Mode. In Marathon, you have ten seconds per word to decide if it is real or fake, and you go for as long as you can, while Time Trial has you trying to answer as many words as you can in three minutes. Practice is, well, practice, and unless you’re practicing, it’s three strikes and you’re out. 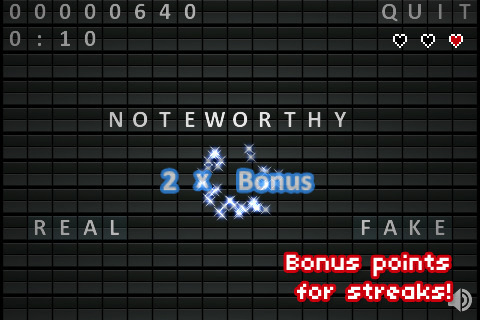 Generally speaking, the game simultaneously tests the range of your vocabulary and the strength of your spelling. This frustrated me a bit, since I would get impatient when I recognized a real word and not check if it was spelled correctly, but this actually makes the game a perfectly reasonable way to improving your spelling. I suppose it somewhat expands your vocabulary too, although you don’t get any definitions or context, so it’s rather less useful. Still, your friends might be impressed that you can accurately spell “chthonic”, even if you don’t know what it means. In addition to three different leaderboards, there are also a ton of OpenFeint achievements to chase down. I was pretty tickled to snag the “English Major” achievement, and I was both surprised and impressed by the robust online experience. I also liked the minimalist layout. It is a little on the stark side, but it was smooth, easy to use, and I enjoyed the anachronistic rail schedule presentation and the accompanying flap flap sounds. Plus, it made the colors and sounds stand out that much more when you got on a streak. Wurd is not a complicated game, by any means, but I really enjoyed it. Some of the fake words are on the egregiously fake side (“ndlaep”?) and some of the real words are a little too easy (“have”? Seriously? ), but most of them require enough brain power to make the overall experience challenging and very satisfying. Even if you just want to learn how to trounce your friends at Scrabble, Wurd is a fun little game and learning tool worth checking out. AppSafari review of Wurd was written by Tracy Yonemoto on May 21st, 2010 and categorized under App Store, Fun, Games, Word Games. Page viewed 3284 times, 1 so far today. Need help on using these apps? Please read the Help Page.